From National Tree to National Dog (Part 2)! We have a number of ‘curly birch’ wood products which are hand-made by Wood Jewel in the small town of Kolari in Northern Finland (above the Arctic Circle). 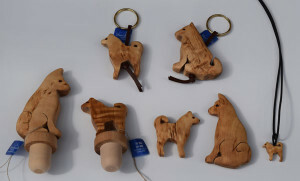 We have key rings, fridge magnets, bottle corks, and a necklace. 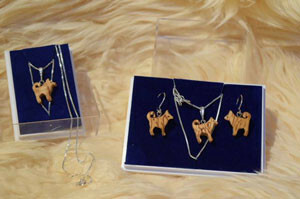 All except the necklace (standing only) are available with either a sitting or a standing dog. The fridge magnets are additionally available in left-facing or right-facing versions. The Silver Birch (Betula pendula) has been the national tree of Finland since 1988 and there are literally millions of them throughout the country. The Finnish Spitz was declared national dog of Finland a few years earlier in 1979. 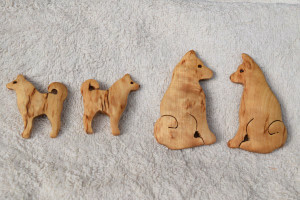 So it seems natural to use wood from the national birch tree to make images and products representing the national dog! ‘Curly birch’ is a genetic variety of the silver birch. Its wood has a curled grain and at various places on the trunk and branches the bark is noticeably thicker than usual. Parts of the bark appear within the wood itself as brown spots or streaks. 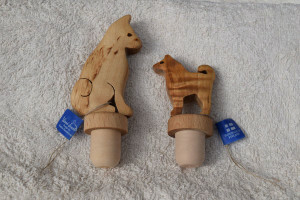 The wood is hard and very decorative, at best resembling wooden marble. 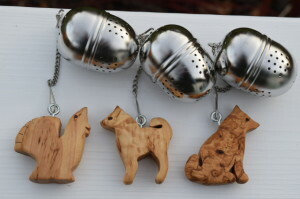 Because of this it is highly prized in Finland for use in handicrafts. 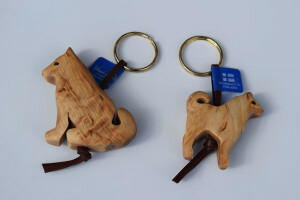 Each item is unique because of the natural patterns in the wood.